Tyanna Buie: Im•Positioned opens at the Lynden Sculpture Garden on Sunday, August 26, 2018 with a reception from 3 to 5 pm. The exhibition is part of Lynden’s Call & Response programming. Call & Response is an ongoing project that gathers a community of artists who share a commitment to the radical Black imagination as a means to re-examine the past and imagine a better future. Im•Positioned remains on view through Sunday, November 25, 2018. 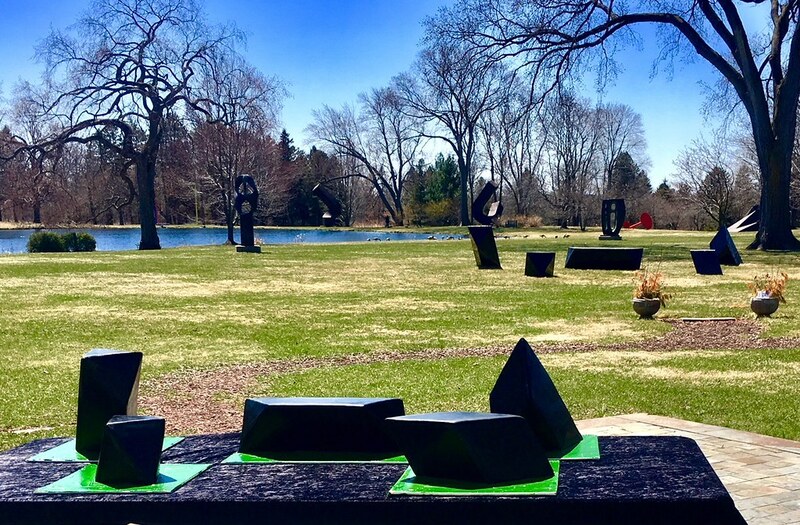 The Lynden Sculpture Garden is located at 2145 West Brown Deer Road, Milwaukee, WI 53217. The reception is free and open to the public. Photographs and other material evidence of Tyanna Buie’s disrupted childhood are rare. In these new works, Buie continues to rely on the collective memory of her family to make connections between the past and present. She gathers memorabilia and re-visits and revives previous impressions from familial accounts and recollections to create large-scale monotypes and screen prints. For Im•Positioned, Buie places these personal investigations in a larger context, responding to the work of other artists in residence at Lynden for Call & Response: echoing the family references in Folayemi Wilson’s Eliza’s Peculiar Cabinet of Curiosities and capturing Reggie Wilson’s bodies in motion. In Im•Positioned, Buie suspends several larger-than-life figures from her Power Pose series (screen print, hand-applied ink, lace trim on paper) at various heights, creating a field of bodies the viewer must navigate—some eye-to-eye, others from below. She has built a theatrical wall-sized installation around a monotype featuring her grandfather and two of her uncles, the exhibition also includes several smaller prints that include recurring imagery, some of which has found its way into the Power Pose series. Tyanna Buie was a 2012 Nohl Fellow, and this exhibition has been organized in conjunction with the 15th anniversary of the Greater Milawukee Foundation’s Mary L. Nohl Fund Fellowships for Individual Artists Program. A Chicago and Milwaukee native, Tyanna Buie received her BA from Western Illinois University, and her MFA from the University of Wisconsin-Madison. While she has attended residency programs throughout the country, exhibited her work both nationally and internationally, she has maintained her connection to the community by hosting printmaking workshops and demonstrations, and participating in Healthy Neighborhood Initiatives through the production of public art for underserved neighborhoods and communities. In 2012, Buie received the Greater Milwaukee Foundation’s Mary L. Nohl Fellowship as an emerging artist, and in 2015 she received the foundation’s Love of Humanity Award. She is also is a 2015 recipient of the prestigious Joan Mitchell Painters & Sculptors Grant. Her work has been featured in Hyperallergic and has been acquired by major institutions and private collections. Buie is currently living in Detroit, where she is an assistant professor and section chair of Printmaking at the College for Creative Studies. Tyanna Buie is represented by The Alice Wilds Gallery in Milwaukee, Wisconsin.